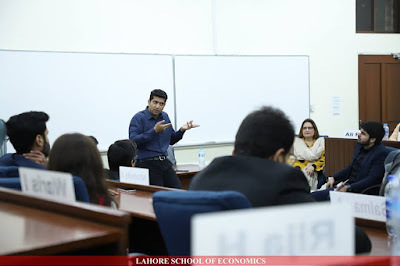 Mr. Monis Rahman, CEO Rozee.pk paid a visit to the Lahore School on 26th November 2018 to deliver a session on Digital Marketing to the MBA cohort. Monis briefed the class about how much change we have experienced in terms of usage of the internet over the last 15 years. In 2003, there were 2 million internet users; now there were 60 million. Now, access to the internet is primarily through the mobile phone. When Monis used to pitch internet usage to banks back then, senior executives used to bring to him printed emails and would laugh at his suggestion to put CVs online. Monis also briefed the class about his project SIMSIM which is a digital one-minute current account or an E-wallet which also offers inter-bank money transfer, help pay bills, do mobile top-ups, book movie and bus tickets etc. He said SIMSIM was competing with large banks. He also spoke about EasyTickets, his application which lets you buy tickets to movies and events from your smartphone. Monis believes the time has come for Pakistan to go digital. Discussing the heart of Digital Marketing, Monis emphasized that there are two types of companies in the E-commerce world: those which are spending large amounts of funds on brand building such as putting up billboards, holding big events, launching TVCs; and those which are using those funds to enhance value to their customers. It is the second type of companies which will win. One of the most important part of digital marketing was the ability to do testing. One could use several version of advertisements at the same time, several captions at the same time, even several variations of the landing page and one could find out which one is working and which one is not, and then stop doing what is not working. We can find out and track who our customers are and where they are. Our objective is not page views but the effectiveness of the landing page – a place on our site which has a high probability of achieving our goal. In response to an oft-asked question as to whether students should join an MNC or become an entrepreneur Monis said it was a false choice. The real question is what the problem is that you want to solve, and then you decide which way will lead to its solution. Of course it is always nice to learn the ropes for 3 to 5 years to understand the ins and outs of an industry. To be an entrepreneur, you need to be resourceful to break walls, have good sales and marketing skills to convince people, employees and customers, and you need to be result-oriented. Monis is an honored guest at the Lahore School and has delivered sessions for the MBA program both in marketing and in leadership courses. We are proud to have him on our campus.